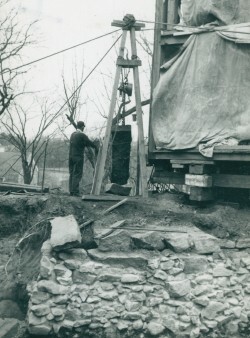 In late 1950, as architect William Morris Hunt II and his crew cleared the future site of the Suffolk Resolves House, they were surprised to discover an underground chamber of finished granite, 16 feet long, 4 feet wide, and nearly 6 feet in height. The chamber is at the center of a mound of quarried granite 12 feet wide and nearly 20 feet long, and topped by 8-foot long, expertly shaped slabs. Hunt's photos above show their discovery as they dug the foundation for the Suffolk Resolves House. The room has a finished, full-height doorway on its southeast (long) side, just off to the right of righthand photo above. Albert K. Teele's The History of Milton records that Dr. John Sprague (the younger) of Dedham built a house on the site in 1780, serving the area as a physician until he returned to Dedham, where he died in 1800. The house and 100 acres went to the Eustis family who moved the structure uphill to a new site sometime in the first half of the 19th century. Construction of the granite room does not seem to be recorded, but the 19th-century plug-and-feather quarry marks postdate Dr. Sprague. Compare the quarry marks in the ceiling of the room below to Mary Gage's excellent reference The Art of Splitting Stone: Early Rock Quarrying Methods in Pre-industrial New England 1630-1825. Though we can confidently assert that the room was built for storage, its more precise purpose remains as much a mystery as its origins. Storerooms are not often made from this amount of granite, finished or otherwise, and we welcome information regarding other examples. In May of 2012, active North American archaeologist Vanessa Sullivan joined our curator Steve Kluskens, a former Paleolithic archaeologist, to conduct a 2' by 4' survey excavation of the dirt floor of the room. 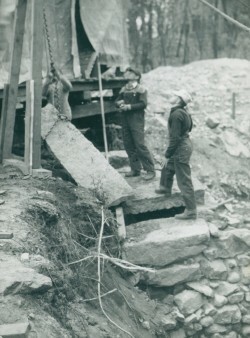 They concluded that Hunt's crew excavated the floor down to bedrock in 1950, and that no occupation floor or artifacts predating the 20th century remain. On occasion the granite room will be open for viewing at our Suffolk Resolves House open houses. Come take a look and venture your own ideas!